By now all the filmy fans know that celebs have a special place in their wardrobe for Sabyasachi Mukherji creations. The renowned fashion designer picks only the best for these starry personalities for the special occasions, be it personal or professional. The recent celeb who flaunted his creation was Alia Bhatt. 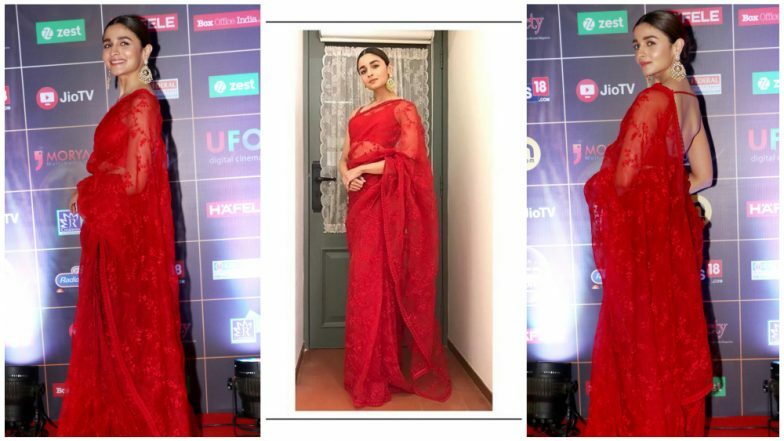 The Kalank actress looked gorgeous in a bold red saree as she attended the News18 Reel Movie Awards 2019. Alia Bhatt's Three Stunning Bridal Looks. The dimpled beauty wore a sleek bun and kept her look easy-breezy with statement earrings only. She opted for heritage Sabyasachi jewellery collection for the night. Styled by Ami Patel and Sanjay Dohliya, she carried the look elegantly. Her hair and make-up was on point done by Puneet Saini and Priyanka Borkar, respectively. Check out her pictures below, posted by the ace designer himself. Meanwhile, her look is majorly resembles to that of Deepika Padukone, another favourite celeb of the designer. DP is known to pull off each and every Sabyasachi saree with grace. Interestingly, her signature look for the designer always consists of sleek low bun, statement earrings and less of dramatic make-up, allowing the saree to do the rest of the talking. Alia too was seen in a similar fashion. Deepika Padukone in Sabyasachi. On the other hand, Sabya is also known to be the go-to person when it comes to grand Bollywood weddings. With Alia and Ranbir Kapoor's wedding speculations being on fire, we won't be surprised if she becomes the next Bollywood bride for him! Coming back to Alia, do let us know your take on her look for the award ceremony.